How To Remove Pet Odor / Urine Smell on Artificial Grass? 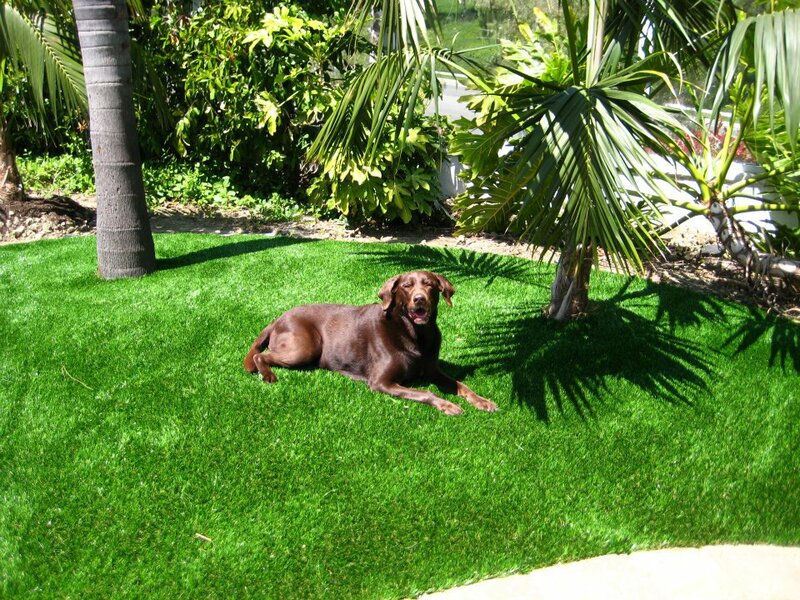 Home > Knowledge Center > How To Remove Pet Odor / Urine Smell on Artificial Grass? Do you have Artificial Grass, native landscapes and hardscapes that your pets use for their bathroom? Well there is good news. With the proper application of Urea “Z” your pet odors will be reduced or eliminated and not just masked over like many other products on the market. I will first start with a basic product description of Urea “Z” and then an in-depth interview with Joven Celindro of Global Power Inc.. 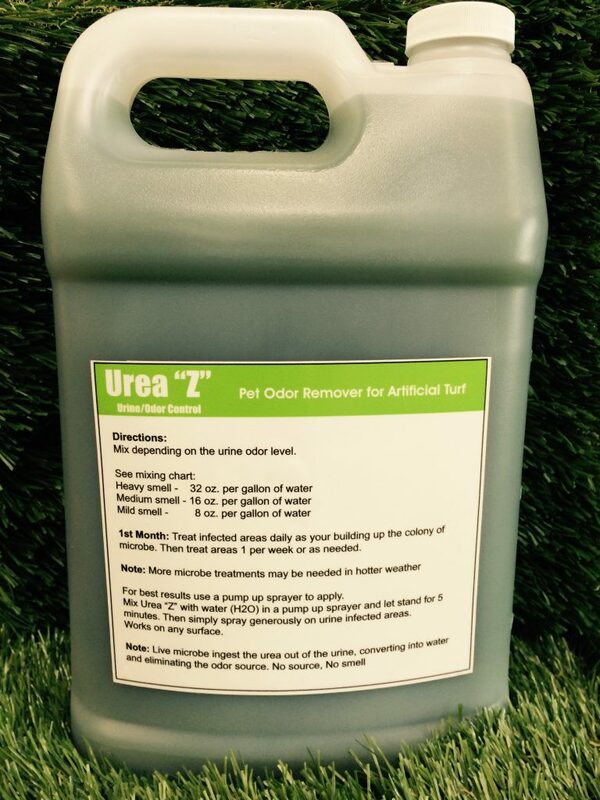 Product Description: Urea “Z” is a Clean, Green and Efficient Urine/Odor Control specifically designed to reduce or eliminate urine odors in artificial grass, synthetic turf, outdoor patio’s, jog and walkways, dog runs, playgrounds, cement and brick, carpet, wood, soil (wet or dry) and Real Landscapes. Urea “Z “ consists of billions of microbes designed to eat urea, a chemical found in urine that produces the pungent ammonia smell. The microbes ingest the Urea out of the Urine and convert it into water (H20 ) and cabon dioxide (odorless). It eliminates the source. No source, no smell! Urea “Z” is not a mask over product or deodorizer. This is a bio-remediation using advanced microbe technology. Urea “Z” is environmentally safe for humans, animals, landscapes and marine life. Ron: What Is Urea “Z”? Joven: It is a microbe-based product designed to eat urea which is the chemical found in urine that creates the pungent/ammonia odor smell. With artificial turf and dog urine, the uric salt can get trapped in the fibers of the turf. This gives it an opportunity to ferment. We developed the product for easy application with a pump sprayer or directly to your garden hose. For now, I will explain how Urea “Z” works and we can get into the application process later. When applied, the microbe will soak into the thatching and make it their home. Once residing in the thatching or soil, they wait for the urine so they can eat. The microbes multiply every 20 minutes so you will never be short of soldiers to take care of the odor problem by multiplying or reapplication as needed, they build a colony of soldiers designed to ingest the urine and convert it to water and carbon dioxide. This is a perfect by product for everything green living outdoors to thrive on. Ron: I have been to hundreds of prospective client’s home’s and can be overwhelmed with the smell of urine in the native soils, sod, concrete or pavers. Will Urea “Z” work for these area’s or just with Artificial Grass.? Joven: Great question, this product will work on any surface. It can be applied to dry or wet surfaces and even in water. It can be used on substrates, flooring, carpet or trash cans or any surface that has urine on it. Usually within an hour the microbes have done their job and the smell should have dissipated. For example, we have been hired at many locations to treat non artificial grass areas. It can be applied directly to sidewalks, fire hydrants, bus stop benches, dumpsters and walls. It is similar to the products used in the Gulf of Mexico oil spills. There, the microbes attached themselves to the oil in the water and remained until it’s food source is gone. With Urea “Z” the microbe attaches itself to the urea and remain alive until it’s food source is gone. Ron: I do not have a dog but my neighbor’s dogs like to use my front yard to do their business. Joven: Ha, ha, ha. You are correct. You don’t even have to have dogs to qualify as a user for Urea “Z”. Ron: Urea “Z” comes in one gallon containers. What is the yield of a gallon of Urea “Z” and how much should be used? Joven: One gallon contains over 3 trillion microbes and every 20 minutes they multiply and double. If the microbes were the size of bee’s it would blacken the sky. That being said it will depend on the size of your yard and the size and number of dogs you have. The amount of urine that comes out of a medium size dog is around six ounces. If your dog pee’s three or four times in one day that is 24-32 ounces of urine and if you have two or three dogs this could add up quickly and constantly adds new bacteria to your yard daily. Once you start using the product and build your colony you never stop using it. You will begin to treat your area’s starting once or twice a week and then reduce the amount of applications once your colony of microbes is built. It is, however, a very efficient product and it is diluted with water so it last’s a long time. Your pet’s are never going to stop peeing so if you want to manage the smells it will be part of a routine maintenance schedule. Ron: Is Urea “Z” safe? Joven: Absolutely safe! Urea “Z” is 100% natural. There are no chemicals involved. It is a sly bacteria in a water slick type stasis that keep the microbes asleep until mixed with water. It is safe for pets, humans, birds, fish, vegetation, landscape, tree’s and all animals. Currently your dogs and kids are bringing in good bacteria and bad bacteria. We have to coexist and Urea “Z” helps manage the smells associated with the pet’s we love. Ron: You mentioned Urea “Z” being a routine maintenance treatment and also that is very efficient with a high yield. Can you explain this if greater detail. Joven: Other products on the market may describe themselves as treating urine but may also try to treat and achieve several other tasks. 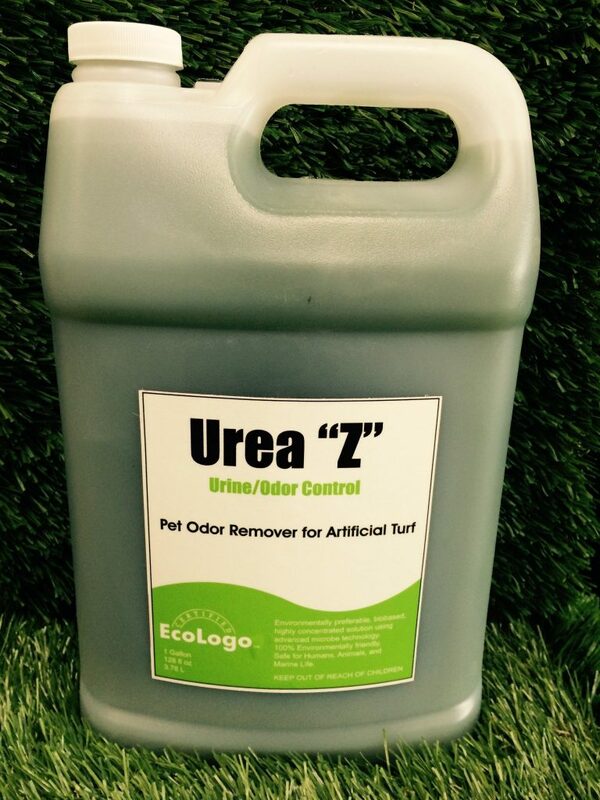 Urea “Z’s” sole purpose is for treating urine. The other products may include 10% to treat urine. Urea “Z” is 100% dedicated to treating urine. Other products will try to mask odors that over time will come back. Urea “Z” smells a little minty when being applied but this was introduced for commercial applications and the “feel good” sensory relief response to smelling the mint for the first five or ten minutes. Rest assured the primary function of our product is to eliminate the source of the odors associated with pet urine and not mask it. When the minty smells subsides your microbes are ready and waiting to go to work. Ron: I field a lot of calls that ask if rinsing the turf with water will help with eliminate urine smells. Doe’s this work? Joven: Absolutely not, this is a common thought and this is not a good thing. Bacteria thrives in water and oxygen. Applying water introduces food for the bad bacteria. Uric salt dries in crystal form and by trying to rinse the area you are feeding the bad bacteria. It is not soluble so it will end up smelling worse. If you find this to be true after the 1st or 2nd application of Urea “Z” this is the active microbes expelling gases. Do not be alarmed. They are ingesting and releasing gases by the millions. The new microbes push the used microbes aside. This is a normal byproduct of first applying Urea “Z”. Ron: We have had great success referring your product to our clients that have multiple pets. With the use of Urea “Z” they are able to enjoy their new yard again. Joven: Thank you Ron. Please remember that Urea “Z” is eco friendly, cost effective and easy to use. Ron: Easy to use and the next time we meet I would like you to explain how to install Urea “Z”. Joven: It would be a pleasure. Stay tuned for Part 2 of Urea “Z” and the application process.